Engineering efficient microbial systems to transform biomass to platform chemicals is a critical step towards a bio-based economy. While a large range of new pathways for desired products has been introduced successfully, their economic viability is often hindered by low biocatalytic efficiency. 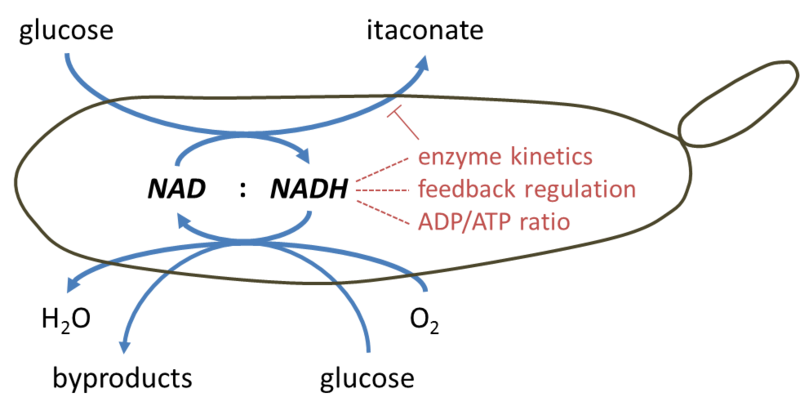 ROXENSE developed a generalizable concept to optimize biocatalytic product yield by targeting metabolic redox balance, thus contributing to a sustainable bioeconomy. The capacity for NAD recycling can be boosted by introducing an NADH-oxidase (NOX). The impact on intracellular NAD redox status can be monitored online using a novel genetically-encoded fluorescent NAD redox sensor. This unique combination of redox analysis and engineering was exemplified by optimizing itaconic acid production in the biotechnologically important fungal biocatalyst Ustilago. It was found that expression of NOX must be tightly controlled, both in its timing and in its expression level. This highlights the need for the redox sensor, which enabled a time-resolved measurement of the cellular redox status. The total budget of ROXENSE is € 149.949. ROXENSE is part of the NRW-Strategieprojekt BioSC and thus funded by the Ministry of Innovation, Science and Research of the German State of North Rhine-Westphalia. Zambanini, T, Hartmann, SK, Schmitz, LM, Büttner, L, Tehrani, HH, Geiser, E, Beudels, M, Venc, D, Wandrey, G, Büchs, J, Schwarzländer, M, Blank, LM, and Wierckx, N (2017) Promoters from the itaconate cluster of Ustilago maydis are induced by nitrogen depletion. Fungal Biol Biotechnol 4:11.